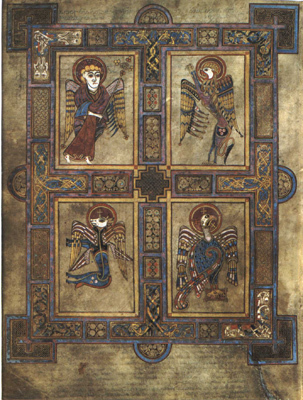 A page from the Book of Kells showing the four Evangelists represented as the living creatures. The logo you see at the upper left of each page and elsewhere on my website is a stylized winged lion. Since ancient times, the symbol of the St. Mark the Evangelist has been a winged lion. The other evangelists have had their symbols as well. Matthew is a winged human. Luke is an winged ox. John is an eagle. These symbols were derived from the four living creatures in the vision of the heavenly throne in Revelation 4 and from Ezekiel 1. Although the biblical texts do nothing to associate these four creatures with the writers of the four Gospels, Christian tradition began to use these creatures and iconography for the Evangelists. These symbols were in place by the early middle ages, and started to make frequent appearances on church facades, in Christian art, and in manuscripts. One such depiction can be found in the Book of Kells created around 800 C.E. Looking for an iconographic logo or seal that I could use as my own identifying mark, I eventually settled upon St. Mark’s symbol, both sharing a name and having an academic interest in Mark’s Gospel. Using several sources, especially images of old stained glass windows, I developed the stylized winged lion you see here.